Richie McCaw already has two Rugby World Cups and can add New Zealander of the Year to the list. Accepting the award from Prime Minister John Key, in typically humble fashion, the former All Blacks' skipper downplayed his achievements compared with the other nominees, rights advocate Louise Nicholas and environmentalist businessman Rob Fenwick. "All I did was play sport, really. Some of these people have done amazing things," he said on Wednesday night at a gala dinner. "I've taken so much out of what I've been able to do. To be able to give back somehow, whatever field, that's something I'm really keen to do." 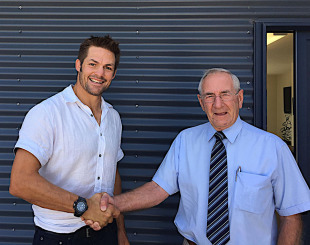 Aside from leading the All Blacks to two consecutive World Cup wins and his stellar 14-year career, McCaw was praised for his work with charity iSport and Leukaemia and Blood Cancer New Zealand, and fundraising for the Christchurch earthquake rebuild. Chief judge Cameron Bennett called McCaw "the genuine article" both on and off the field. Earlier in the evening, women's world No.1 golfer Lydia Ko won the coveted Young New Zealander of the Year award. The 18-year-old, who last year became the youngest golfer - of either gender - to win a major, beat out designer Sean Kelly and scientist Malvindar Singh-Bains. The award follows Ko's win at the New Zealand Open last week and five LPGA titles in 2015. On Thursday, she is up for her third Sportswoman of the Year prize at the Halberg Awards and will also begin the defence of her Australian Open title at The Grange course in Adelaide.